Now, let’s ask what that Sunday worship service was like for our two church attenders. How does it compare with the historic church? What trends are on the rise? What’s declining? 1. Novel and unorthodox teachings that displace the centrality of the gospel: “prosperity” and “best life now” teachings, false super-naturalism and mysticism, self-esteem and how-to teachings. 2. Culture-driven models for worship, the most popular being the rock concert approach in which the congregation observes musical and artistic performers and speakers, complete with stage, light show, and smoke. Does a great concert lead to great worship? 3. Age-segregated worship services for every stage of life which contributes to the juvenilization of American Christianity. 4. Culture-driven models for pastoral ministry, including the rise of the “leader” pastor (visionary, strategist), and the “celebrity” pastor (personal charisma, media image, marketable). 5. Independent churches that isolate themselves from other churches and are therefore unaccountable to a larger group of churches. This accelerates the disunity of the Church and contributes to the declining influence of the church in America. 6. Non-doctrinal, generic preaching of God’s love disconnected from the cross, and faith disconnected from Christ. 7. Embracing the redefining-marriage movement driven by the LGBT community. The most recent example of this was the Presbyterian Church in the USA (PCUSA) vote to redefine marriage to include same-gender couples last week. 9. Presenting the gospel as the central message of hope for both Christians and non-Christians. In fact, our two church members may not be sure what the gospel is, i.e. the announcement that God will graciously forgive sinners and grant them eternal life through trust in the life, death and resurrection of Jesus Christ. 10. Congregational sharing in the Lord’s Table (also known as the Eucharist, Communion, The Lord’s Supper) as the central event of Christian worship, whether as a sacrament, sign, or memorial. New Year’s Eve or Easter Sunday? 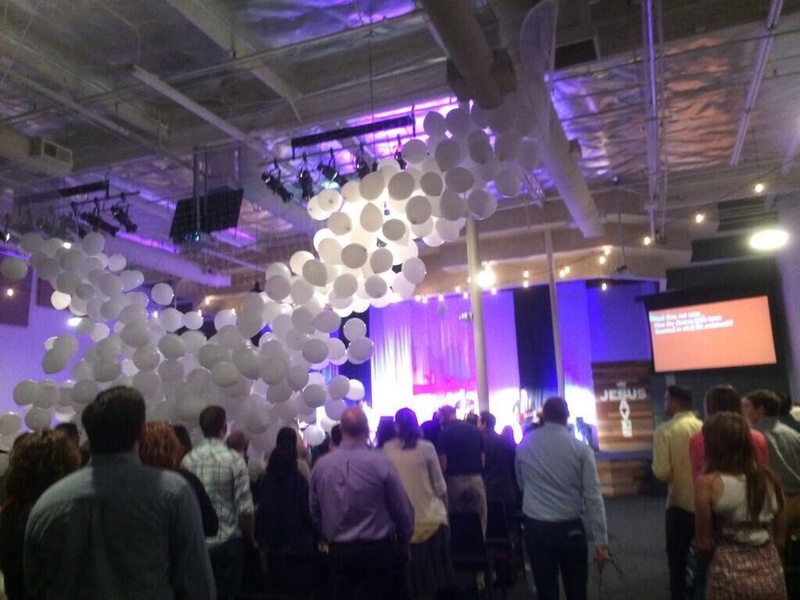 Replacing bread and wine with balloons. 11. Comprehensive instruction and study of the Bible or biblical doctrine as the foundation of Christian discipleship and spiritual growth. This is often replaced today by “more practical” (air quotes intended) studies of how one Bible teaching may apply to a life situation. 12. Teaching the “hard” stuff: Bible doctrines related to sin, hell, final judgement, and God’s sovereignty over tragedy and evil. These twelve trends are specific examples of a broader secularizing trend in the American Church, and bad news for our future. Secularism is a worldview at odds with the traditional Christian belief that the Bible is authoritative, definitive, sufficient, intelligent, and relevant. Outside of a true, spiritual awakening and revival, I expect these trends to reduce our two church attenders to one, or less than one, in the next 10-15 years. I’m praying for the revival. › Can We All Be Catholic (Universal) Again? Sad but true. Much of what is (falsely) called “church” today bears little resemblance to tha historic Christian faith. The quest to remain “relevant” has led to complete IRRELEVANCE. True God-sent revival is the only hope for the church to again impact this nation with the Gospel. I just wonder how long until the wider church world sees and agrees. Thanks, Roger! Lon, is the Presbyterian USA Church a truly Christian church? Do they consider themselves of the Reformed faith? Hi Dana! The WCF definition of a “true” church is one that a) righty preaches the gospel, b) rightly administers the sacraments, c) rightly administers discipline. By this definition It’s hard to imagine the PCUSA as a true church. But every denomination has a variety of pastors and each is unique. So, there may be many “true churches” within the PCUSA which are dismayed at their parent denomination. I agree with most of what you mention. Except maybe for the piece on worship. 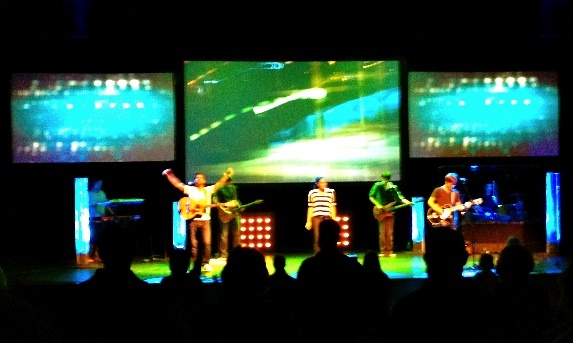 I don’t think genuine worship and lights and smoke are mutually exclusive. They set a mood – reverence or celebration – and when used well (i.e. not focused only on the stage) they can be employed to bring the congregation into the act of worship rather than separating them from a performance. It’s the stained glass and candlelight of this age. I’ve been in the booth with tech teams who are very much using their gifts to glorify God. And using light (smoke is part of lighting if you didnt know) as a part of worship is fitting of a creative God who IS the light of the world. But, I think there is a fine line between leading worship and performing a Christian concert. On that point we agree. Thanks for the comment Brandon. I really appreciate your perspective. As you know my background is pretty varied on the topic of what is worship, and how is God worshipped. Many years ago, I was more open to your perspective, then over time reconsidered. I think another twenty years in this direction will show us whether this is a good thing or not. Thanks again for your comment. I always value your contribution. 2, 4, 6, 9 have driven me nuts – esp in laid-back CA where the relaxed culture has relaxed theology. I’ve wondered – sitting under some sermons out here – “Uh, Pastor, could you move over so I can SEE JESUS? ?” It is actually scary what conglomerates of churches are doing in the name of Christianity. Fortunately, we do have some rock solid gems of preachers and teachers here. Thanks for commenting! I agree. And, as far as I know, I don’t think anyone is talking about #4. Is anyone making this an issue? Also, I should have added the “Celebration Service” aka “Memorial Service” departure from “Funeral.” I read a great article years ago about how evangelicals are turning them into “FUN”erals.